Today we have some good news for all Kenyan taxpayers! One of the best things has happened to us taxpayers. The Salaries and Remuneration Commission (SRC)has decided to reduce the public wage bill burden from the shoulders of taxpayers. These are not proposals for discussion but a government policy. The Press Release and gazette notice provides a salary structure for state officers for the years between 2017 and 2022. This a product of a thorough and comprehensive job evaluation. A part from public service wage bill, other remuneration factors were considered. These are: ordinary revenue, Gross Domestic Product (GDP) and expenditure. The SRC has a policy of reviewing salary and benefits for all state officers. The resulting salary structure will be used until 2022. It will be effective as from August 8th when new state officers will be ushered into office through elections. Article 60 of the Constitution of Kenya defines a state officer as “a person holding a State Office.” These are as follows: President, Deputy President, Members of Parliament (MPs); Senator, Speaker and Members of County Assembly (MCAs). The Salaries and Remuneration Commission (SRC) did not just fix the salaries arbitrary. They benched marked with countries with the same GDP as Kenya. This is a good practice. 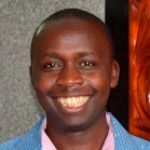 The principles set out in the Constitution of Kenya are: objectivity and impartiality; legal compliance; competitiveness; equity and fairness; adequacy; transparency and public participation among others. Further, Salaries and Remuneration Commission (SRC) was seeking to identify and seal loopholes in the misuse of allowances and benefits in the public sector. I celebrate these actions because now the SRC has harmonized our salaries and benefits with those of the rest of the world. There is no way, our country can be paying the highest salaries to state officers than even those of the officers working for developed countries. The Commission has expressly stated that they held public participation with many state organs, special interest groups, religious organizations and members of the public. Therefore, SRC can proudly say that this is a voice of the people. A voice of the people is a voice of God. It is time for public officers to lead “modest lives” and be accountable to us members of the public. What will state officers at national level take home? The President of Kenya will shed off Ksh. 206,250 from his monthly salary. The Deputy President position lose a lower amount of Ksh. 175,312. From 2013 to 2017, the Cabinet Secretaries, Secretary to the Cabinet, Attorney General (AG), Chief of Defence Forces have been earning the same amount of Ksh. 1,056,000. They will now lose Ksh. 124,000 from their monthly salary. The principal Secretary, Vice Chief of Defence Forces, Inspector General of National Police Service, Commander of Kenya Army, Director General of National Intelligence Service (NIS) are all under the same salary bracket. Their remuneration package will drop from Ksh. 874,500 to Ksh. 765,188. 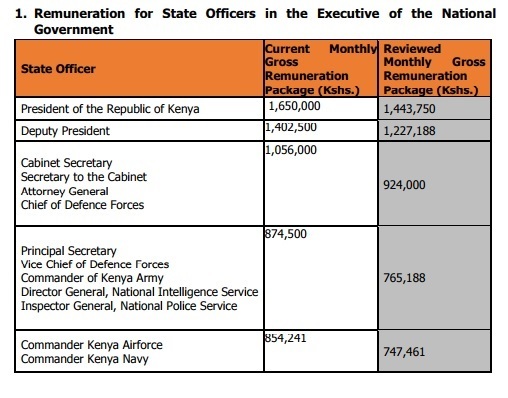 The Commander of Kenya Navy and Airforce takes home the same remuneration package currently at Ksh. 854,241 which will reduce to Ksh. 747,461. The Speaker of the Senate and National Assembly earn the same remuneration package at Ksh. 1.32 million which has been cut to Ksh. 1.15 million. The other positions are as shown in the table above. 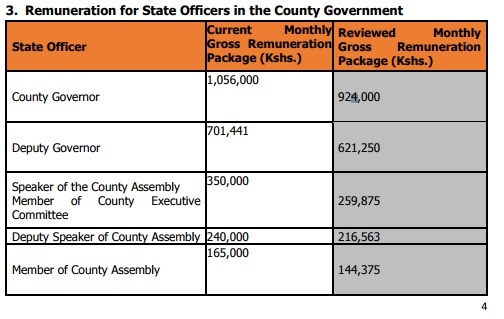 Those who will become governors in the next term will earn an amount less by 132,000 from the current salary of Ksh. 1,056,000. The incoming MCAs will earn Ksh. 144,375 which is less than their current Ksh. 165,000 remuneration package. A number of allowances have been abolished to relieve tax payers from the huge burden of public debt. The MCAs will not be receiving allowances for plenary sessions and mileage allowances. At the National Assembly and Senate, the members of the 12th parliament will cease to benefit from reimbursable mileage allowance and sitting allowance for plenary sessions among others. These new changes from Salaries and Remuneration Commission is estimated to save Ksh. 8 billion shillings.